A user is allowed to upload up to a maximum of 1GB per upload, download links of the file can be seen in your jotform Submission or even in your Email after notified. 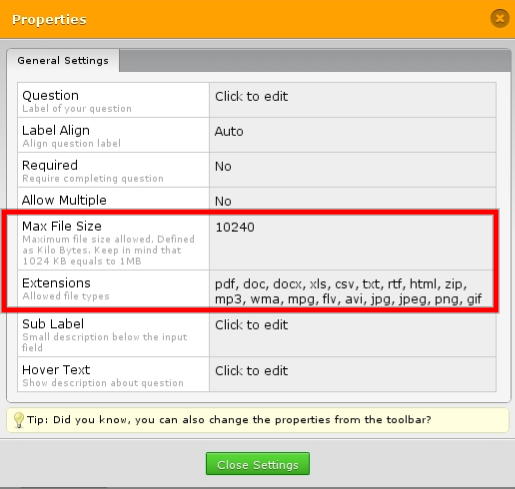 You can also have complete control to what type of file extensions you wish to receive in your upload field and adjust the max file size that you wish to receive in the properties of the file upload field. For further assistance, please don't hesitate to contact us! Thank you for using JotForm! Yes, we have Dropbox integration option, and as stated Pinoytech it is possible to upload big files. Please note that Dropbox uploads are limited around 300MB per session due to their API limitations.